Or so they tell us… the simple recipe below has been forwarded to us by a fabulous foodie friend. Known as “Scout’s Cupcakes”, it would be cruel not to forward this sure-fire wining recipe onto you. These cupcakes are very naughty (not for the sugar-free set). They will hit the spot when the event calls for an indulgent sweet treat. - Into a 1 cup metric measuring cup place 2 eggs, fill to the top with thickened cream and place in a bowl. - Beat 1 minute using electric beaters, add 1 splash vanilla essence and 3/4 cup caster sugar and beat for 3 minutes. - Sift in 1 cup SR flour and fold into mixture, place in 12 patty pans. - Bake in moderate oven until light golden and cakes spring back when lightly touched in the centre (about 12-15 minutes. 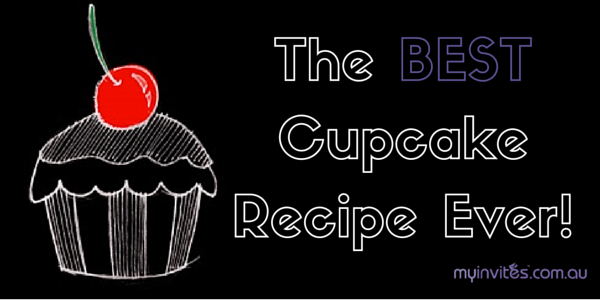 Planning a cupcake party? make sure you take a peek at our delicious range of cupcake party invitations here.